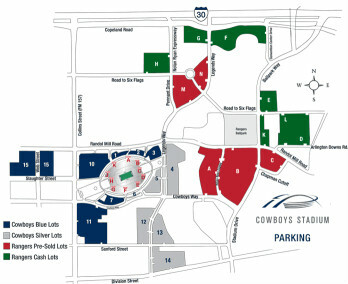 For RV, BUS or LIMO parking you will need a special pass. Please call 817-892-4400. 12 BLUE LOT 15 • $125.00 ea. 1 SILVER LOT 14 • $135.00 ea. 12 SILVER LOT 13 • $165.00 ea. 12 BLUE LOT 11 • $185.00 ea. 12 SILVER LOT 4 • $225.00 ea. 12 BLUE LOT 10 • $225.00 ea. 12 SILVER LOT 13 • $145.00 ea. 12 BLUE LOT 11 • $165.00 ea. 12 SILVER LOT 4 • $195.00 ea. 12 BLUE LOT 10 • $195.00 ea. certain shipping restrictions may apply to these type of orders. Any questions please email us. The use of CowboysTickets.com is subject to the terms and conditions in our purchase policy. By clicking "Order Parking Passes Now" you agree to those terms and conditions outlined in our purchase policy. Copyright © 1996-2018 CowboysTickets.com • All rights reserved.